Social bookmarking is a way of using social bookmarks to manage article or articles and sharing it on all or selected social-media sites. Most bloggers use it to gain more exposure and to connect to a wider audience. Plus, it enables blog readers to share the post they like, to their friends, acquaintances and family in no time. In short, social bookmarking help bloggers to increment blog readership. The reason it is now a must-have tweak or widget to all bloggers, both amateur and professional. So if you don’t have it yet, I think it is now the proper time to apply it in your blog post. In this article, I will be sharing you the two new easy ways of putting social bookmarks at the bottom of each post without the need to edit your blogger template. It simply means; you needno html knowledge to do this. In fact, a grade six pupil can do this tutorial without a hassle. Now let’s start. How to add social bookmarking buttons with built-in blogger social bookmarks? Look for blog posts, it is usually after the Header, click edit. Now a new window is open, find the “Show Share Button” and have it check. Push the save button; that’s it, you now have a social bookmarks at the bottom of your post. 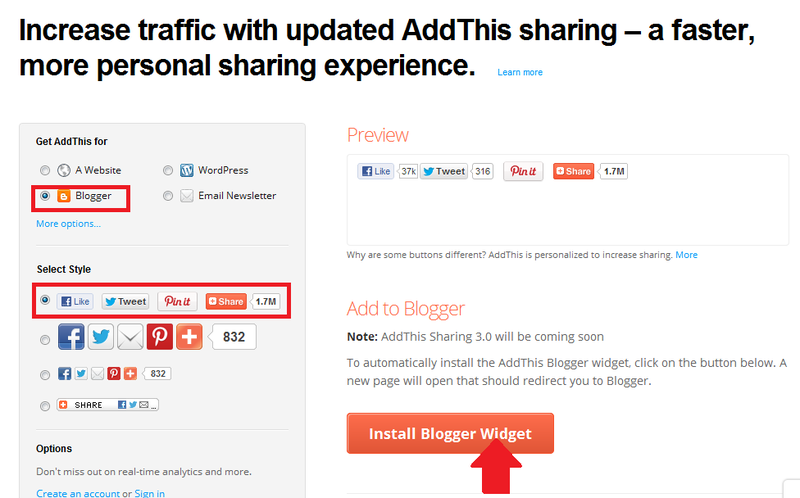 How to add social bookmarking buttons with the help of Addthis plugin? Press the “Get the sharing button“. A new window will appear, it’s optional, you can sign up, but if you don’t mind just press X. Choose which style would you prefer. bookmarks at the bottom of your posts. That’s it, the two new easy ways on How to add social bookmarking buttons in blogger/blogspot blog. Do you have something to share? Feel free to comment below. Thanks for giving such a very useful information.